Just a thanks to the places where we stopped on the small info tour in Holland in the beginning of september. It’s been nice to meet so many people and to see other projects working to make the world more of the place we want to be living in! Last day (23.09.2014) around noon an excavator was stopped which was working at the old railway of the lignite industry close to Cologne, Germany. The railway as well as the open pits and the power plants belongs to the company RWE. The railway was used for the transport of the lignite directy from the pits to the power plants. But now, parts of the railway and the highway A4 were build new some kilometers more south to make space for the growing mine. The company „H.-B. Kaiser , Abbruch und Erdbewegungen, in 52388 Nörvenich“ is in charge of removing the old railway. 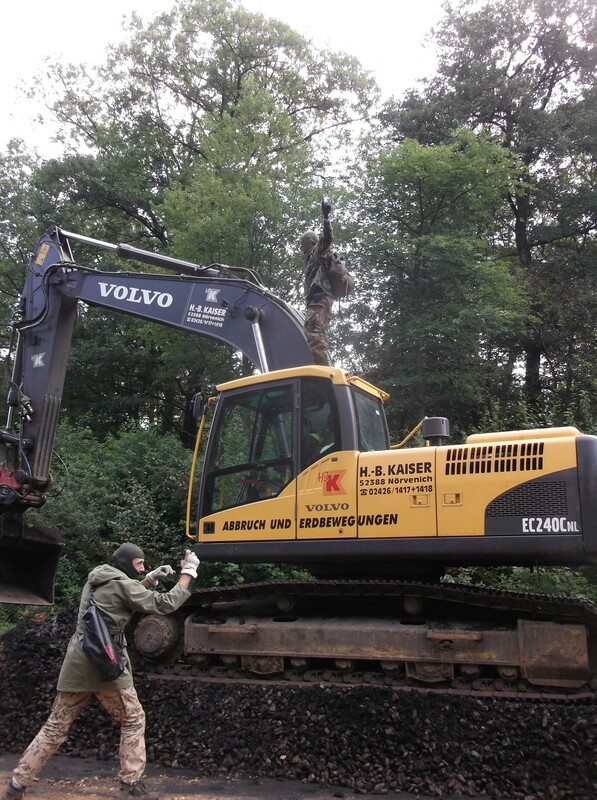 Furthermore, the security company „ KÖTTER Security“ and the foresting company „Krobbach“ from Melsbach are taking part in the destruction of the nature that RWE is commiting. These companies are also to mark, to block and to sabotage! Every day is an action day! – Earth First! The Hambach Forest Occupation with its merry bunch of forest pirates invites you to the second Skillsharing Camp we’re hosting this year! We want to carry out a second act, a part two for the skillsharing event we held this spring, during which the Hambach forest was successfully resquatted. Today, the new part of the Autobahn, which they built to help further the expansion of the mine, will be opened with an official celebration. 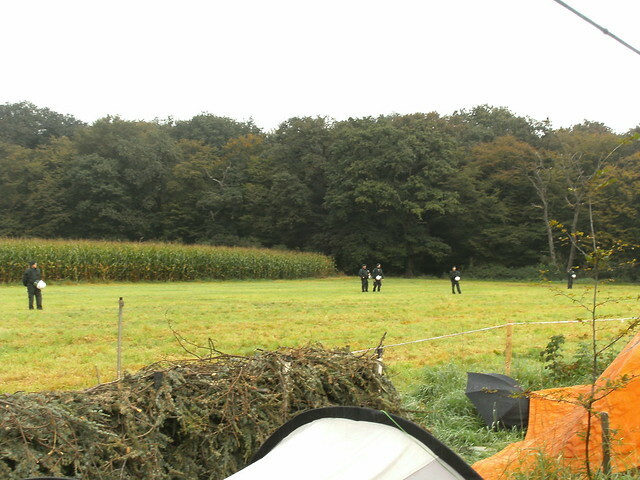 Apparently, the police chose the same day to disturb our resistance in the forest and on the meadow. They appeared as early as 8:00h this morning and are giving us trouble since then. Follow us here today, we will regularly publish new updates, ticker-style. 12.50 the official opening at the highway is over. 13.10 police “retreats” a bit, leaving oaktown, a treehouse occupation, for now. 13:40 A small group of people got controlled by Police, one person arrested for lack of I.D. 15:00 No more police or other enemies in the Forest – one security car was passing through the removed barricades, but left again quite quickly. The ticker will go on break for now, if there’s any more action we’ll be updating again.